Send the right message with a soft-sided leather briefcase in always-appropriate black. The outer flap pocket gives the bag an adventurous vibe without sacrificing professionalism. Use the adjustablet shoulder strap to wear it as a messenger bag or carry it with the double handles for the look of an attache bag. Two roomy compartments allow you to divide and organize your gear. With two exterior pockets and an inside organizer panel, you have plenty of options for stashing small items such as keys, your cellphone, ear phones, pens, DVDs and sunglasses. 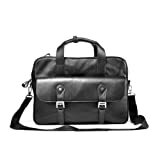 Ditch that ugly old rip-stop messenger bag and upgrade to a quality leather business accessory. It’s about time. This entry was posted in Luggage and tagged Black, Briefcase, Genuine, iCarryAlls, Leather, Messenger, SoftSided, Sojourner by Perfect Vacation. Bookmark the permalink.